Marriage means something exceptional to each one of us. Everyone experiences it in his/her own way with his/her own feelings. However, the desire to look at one’s best and stunning is common to all of us. Nothing beats those beautiful wedding photos that feature perfect you. Early bird package: suitable for those who decide early – at least 6 months before the wedding. Training is 3 times a week and includes nutritional recommendation and Gym membership. 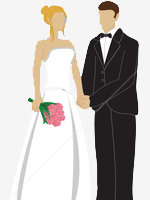 Last minute package: suitable for those who decide late - less than 3 months before the wedding. Training is 5 times a week and includes nutritional recommendation and Gym membership.